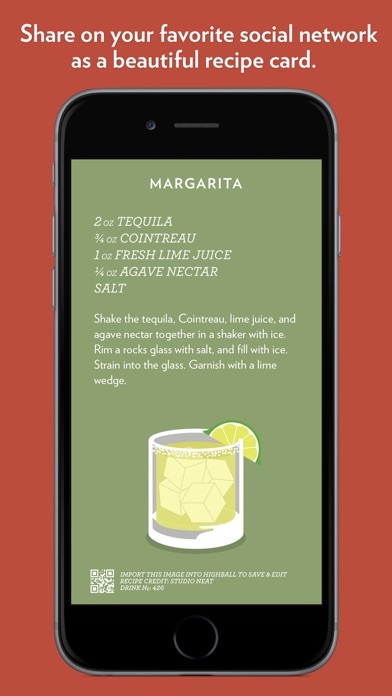 As it stands, this is a recipe book app, not a mixology app. Built in recipes are the tried and true, none of that slapped together urban dictionary recipes. Lovely and free. Worst cocktail app out there. I like to have classic and newer cocktails listed. That’s the stepping board for creating my own versions and cocktails. Beautiful little app that's only missing one thing, filtering. I've added quite a few of my own cocktails but it can be a little cumbersome to find what I'm looking for. Other than that it's really a great app. This is a lovely app. I mean specifically the looks. I use the app to keep track of recipes but the app needs just a few additions. The ability to sort would be huge and is the largest need. The ability to backup is almost as important. I’d pay a few bucks if they added a good sorting option. Also searching the recipes they have is quite poor. It seems they made the app to try and sell their hardware. The ice mood and such. Redirect the business model and update the app. Could make a few bucks. Make a follower ability so I can follow cocktail artists I like. 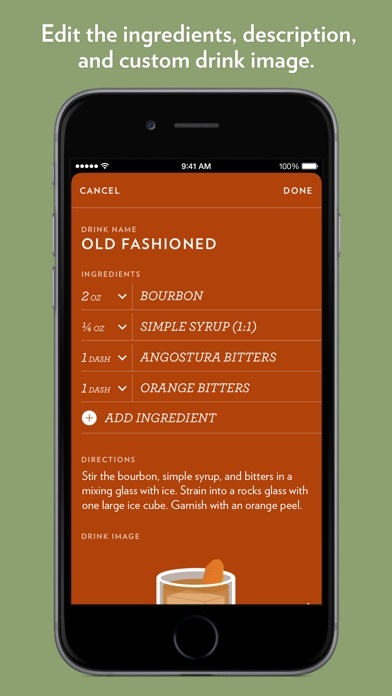 Within recipe cards, there needs to be a way to easily move items within the ingredient list via tap/hold/drag—just like moving recipe cards with the catalog. Great basic recipe book, but lacks some features. I’ve been using this for years. I love how simple and clean it is. However, I wish I could just swipe between cards, rather than having to open and close them one by one. I mainly rated it low because it has no syncing functionality. I cannot sync my recipes with iCloud, nor with their system. I was forced to reset my phone and thus lost many personal recipes. I think I’ll try another app for now, before I build up my recipes again. 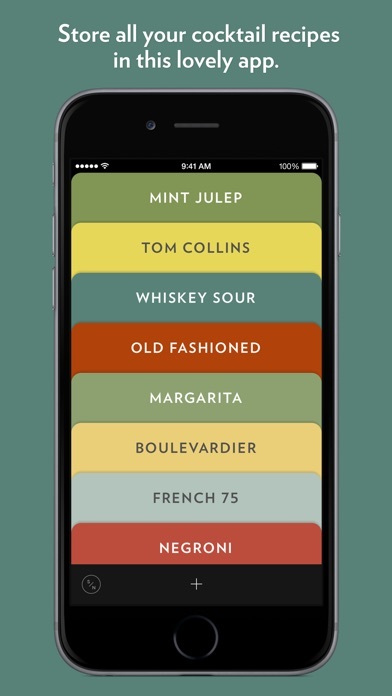 This is the best looking cocktail app in the store. I love that it is focused on storing your own recipes rather than being a big database of existing recipes. It’s clearly focused on the enthusiast with their own recipe collection rather than the person who wants to make a drink here or there. With that said, I wish they would put a little more time into development and add a few features that could greatly improve the app. Ability to sort and categorize your recipes would be huge. Currently the best you can do is by color of the cards or where you place them in order. Another is backup. There needs to be a way to back up to the cloud. As is, what’s the point of manually typing up all of your recipes only to have them tied to one device? Phone breaks, so does your recipe collection. 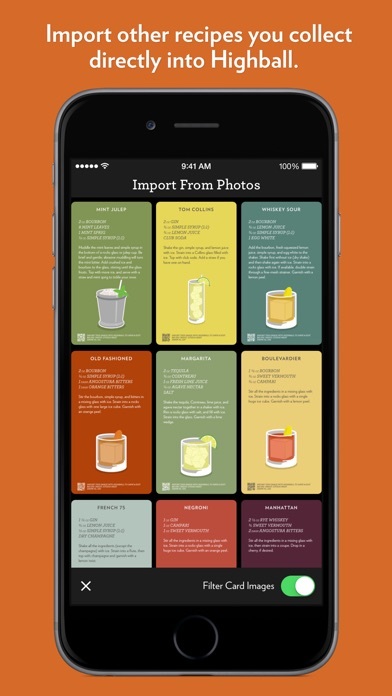 And exporting each recipe card, one by one isn’t a realistic workaround for a large library. As it currently stands, this is more of a novelty way to make pretty recipe cards than an actual useful tool. Dear Studio Neat, several reviews have mentioned a pay model. Seriously... charge us for the app. Even just add cloud backup and an iPad version and I’ll gladly shell out a few $$.